Deliberation in legislature is an intellectual process through which information is both gathered and weighed, costs of implementation are taken into account, other options are identified, and benefits, harms, as well as unintended consequences are examined. In a manner that is almost completely whimsical, the Philippines legislature has decided to pay for the college tuition in all state universities and colleges (SUCs) for the year 2017. Eight billion pesos have been added to the higher education budget for 2017, solely earmarked to subsidize the tuition of almost one and a half million students of SUCs. Whether this goes beyond one year is unclear since this is a one time funding provided by an appropriations bill. What is crystal clear, however, is that the Philippine lawmakers can decide where billions of pesos will go, seemingly without any thoughtful deliberation. The Philippines has embarked on an enormous P150-billion project -- the K to 12 -- that is set to add as part of the basic education a mandatory kindergarten and an additional two years to the high school. The mandatory kindergarten is not contentious because there is empirical evidence that it does improve learning outcomes. It is the learning outcomes that should concern us here. I still have to see evidence (perhaps I did not look hard enough) that the additional two years of high school will improve learning performance. Fabella, in his criticism of K to 12, advises us to consider one very important principle in economics: "Private benefit, private cost". How much higher education benefits an individual is often used as an argument for tuition fees in higher education. There is no indication that the budget reallocation to cover tuition fees is meant only for those who are in need. 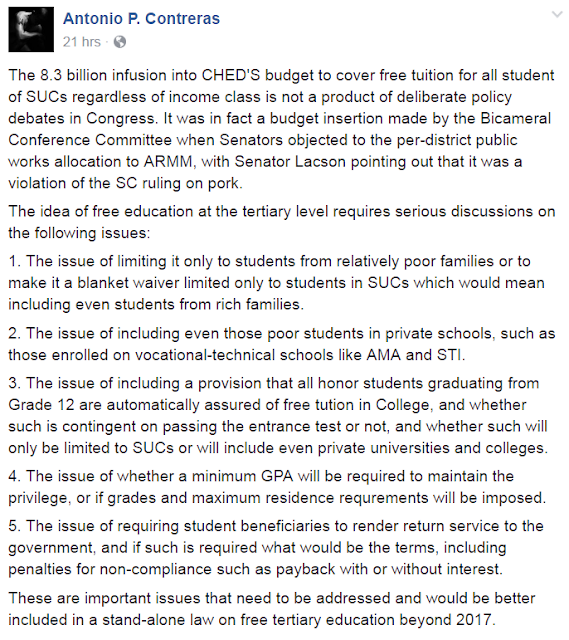 Thus, dismissing critics by stating that implementing rules have not been set yet are missing the fact that this was a clear budget item with no room for ambiguity. The number eight billion comes from a simple calculation of the amount needed to cover a 5000-6000 peso tuition fee in SUCs for roughly 1.5 million students. "Senator Recto, also sees no difficulty in disbursing the fund to all public universities and colleges as this will be implemented “wholesale” and not “retail spending.”" SUCs are simply going to be reimbursed based on their enrollment numbers. There are really no implementing rules that need to be written. Another quick response to criticisms against free college tuition is the fact that a number of European countries are able to offer free college. This of course addresses the question of whether such measure is sustainable or affordable. It is good to point out that some countries are able to do so. However, one must take into account how these countries can afford such a policy. Countries like Finland and Germany have very high income tax rates. Secondly, Finland and Germany have much better basic education systems. Income achievement gaps in basic education decide who will be college-bound. In the Philippines, children from poor families are less likely to finish high school. This simply makes college with free tuition out of reach to these poor children. The enrollment data from SUCs in the Philippines clearly show that no tuition fees in college are simply skewed to benefit those who can afford to pay tuition. Tuition fees represent only a small fraction of the real problems of higher education in the Philippines. Quality is its biggest problem. The lack of scholarly and research output is so evident in the fact that not even a handful of universities make it into the list of respectable institutions of higher learning in Asia. The dismal passing rate even in licensure exams like teaching is a testament to the low quality of undergraduate instruction in Philippines' SUCs. Providing college with free tuition does not solve this more pressing problem. Only resources for additional infrastructure and faculty development will help. Thus, paying for everyone's tuition only takes money away from much more needed resources in colleges. Worse, making college free can attract increased enrollment in SUCs, which will further stretch limited resources to answer a spike in demand. Whether free college really benefits the poor is likewise questionable. The Philippines Statistics Authority reports that in 2010, nearly 7 million aged 17 years or older have not finished high school. More importantly, tuition is not the only cost hindering poor children from college education. There are miscellaneous fees, textbooks, and living expenses that are in fact higher than the 5000 to 6000 pesos per year tuition in SUCs in the Philippines. To help indigent students, it requires so much more than just paying for their tuition. 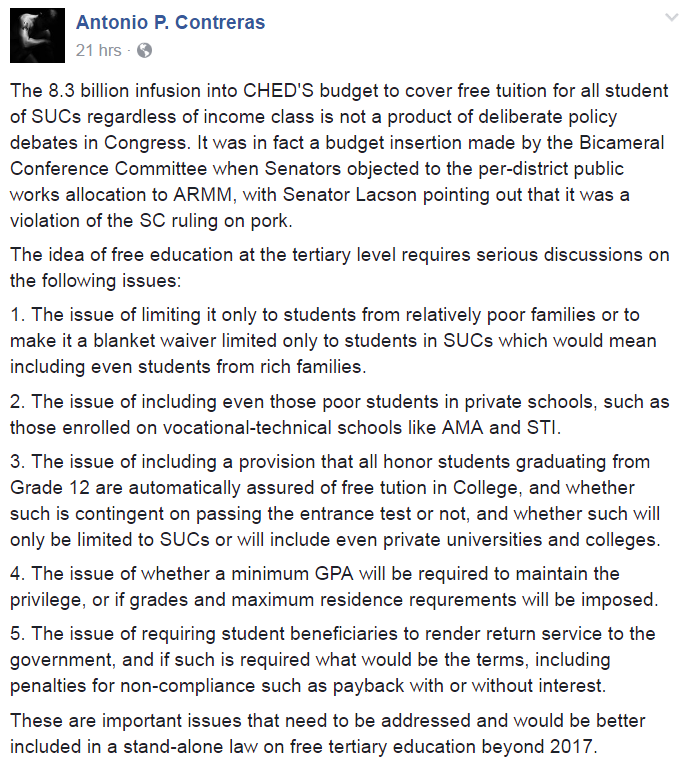 Without additional aid in the form of stipends or allowances, subsidizing tuition alone will not help. requires thoughtful deliberation. This obviously has not occurred and when criticisms are brought forth, these are even dismissed outright. Education problems in the Philippines cannot be faced without a thoughtful consideration of evidence. These deliberations are necessary. I am not alone in this comment. Antonio Contreras of De La Salle University has posted the following on Facebook.